The Los Angeles Department of Water and Power wrapped up work earlier this year on the largest municipally-owned wind farm in the United States-the 120 MW Pine Tree project-which came with its own set of challenges, being located in the rugged Tehachapi Mountains, northwest of the city. The recently completed 120 MW Pine Tree wind power project in California is the largest municipally-owned wind farm in the United States, but it's only the start of what is expected to be a major move to renewable energy by the Los Angeles Department of Water and Power (LADWP) over the next few years. "Wind power is an important component in the overall power mix, as we diversify and move away from coal towards renewable energy," says David Nahai, general manager of LADWP. "It will play an important part, but it will be just one element in a very diversified portfolio that will also have solar, geothermal, biomass, and other types of renewable energy," added Nahai. LADWP and other California utilities are looking at some high renewable energy benchmarks in coming years. California's Renewable Portfolio Standard (RPS) is the most aggressive renewable energy standard in the U.S. It requires utilities to produce 20 percent from renewable sources by 2010, and 33 percent by 2020. The Pine Tree project certainly plays a role in renewable power for Los Angeles. It provides 1.4 percent of the city's goal of 20 percent renewable energy. The project-combined with existing hydroelectric and geothermal power sources-brings the renewable power level in Los Angeles to 13 percent of the city's total power supply. The project came with its share of challenges, however. There was a stringent review process for Pine Tree Wind, which is located on 8,000 acres of rugged terrain in the Tehachapi Mountains, about 100 miles northwest of Los Angeles, near Bakersfield. The California Environmental Quality Act requires a very thorough investigation of a major project of this type, notes Nahai. "You cannot undertake a project of this size without extensive dialogue with stakeholders, and we certainly did that," he added. "But overall, Pine Tree has proven to be a successful project for us, especially as it was taken over by us from the developer, and became an ownership project for LADWP." Now retired from LADWP, Bob Gentner was project manager on the Pine Tree project. "The site has very difficult terrain, and that was one of the biggest challenges in the construction of the project," he says. 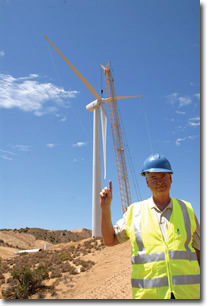 The terrain in the Tehachapi Mountains dictated a different construction approach versus a wind power project built on generally flat land, such as those in the Great Plains states. 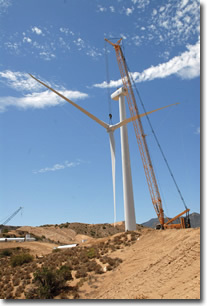 The contract originally called for GE (which supplied the 80 1.5 MW turbines) to erect the turbines. As they got more into the project, however, it became clear that it would be better to broaden the scope of work for the general contractor on the project, Kiewit Corporation, to include erecting the turbines. Kiewit also designed the roads for the project and transported the turbine blades, which proved to be a large project in itself, given the terrain and the steep grades. Pine Tree project manager Bob Gentner (abovet). On the list of the largest municipally owned wind farms in the United States, the Pine Tree project is number one. How steep were the grades? Gentner tells of a truck driver with a shipment of spare blades, who upon arriving at the head of the road into the wind farm said, in no uncertain terms, there was no way he was going up that road. "The roads are quite steep, with grades in excess of 15 percent in some areas." While GE, Kiewit, and sub-contractors may have worked on many wind farms and civil construction projects in the past, "I don't think they had ever seen anything quite like this," says Gentner. Due to the tough terrain and roads, managing the logistics part of the project-including getting turbine parts in-proved to be more demanding than the average wind farm. "It was quite difficult," says Gentner. "The towers are large, and the blades, while not terribly heavy, are certainly very long." Erected, each of the GE turbines stands 213 feet high to the top of the hub, 339 feet including the height of the blades. "When we started building the roads, someone could have looked at them and thought that they seemed overbuilt. But when you see a truck come down the hill with one of those turbine blades, that road can suddenly seem very small." And there were other large components, he noted. "We also put up a substation, designed and built by LADWP, that included a large step-up transformer that weighed over 300,000 pounds, and we were able to get that up the road." As part of the design process for the road system, Kiewit did road models to determine where the trucks, especially the trucks carrying turbine blades, had to be positioned on the road as they went around the corners and turns. "The models were to show that it could be done, but they also provided the truckers with information when they came up the road on what they needed to do to negotiate all the turns," explained Gentner. Because of the big and wide loads they were carrying, the truckers could not always stay in the centre of the road to get around the turns. "I'm not sure if this kind of modeling is done with other wind power projects, but we did it in conjunction with Kiewit, and it proved to be good planning." 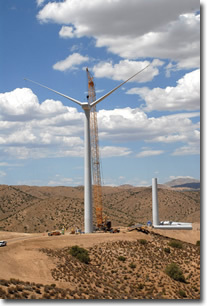 Terrain was one of the biggest challenges in the construction of the Pine Tree wind project. Access roads are steep, with grades in excess of 15 percent in some areas. Kiewit is a very large and experienced construction company. It actually brought together two company divisions to work on the Pine Tree project: a northern division with experience in excavation work and a southern division with extensive crane experience. The dirt roads had a clay type of surface, which tended to get slippery when wet. Kiewit ended up paving the most traveled roads on the wind farm to improve ongoing access for operations people. They had only a single county road to work with-Jawbone Canyon, which connected up to Highway 14. The county road was good and flat, but leading up to the wind farm, the road ended, and the steep grades began. Some 40 miles of road were built for the project. Despite there being in excess of several hundred trips to move turbine parts to the site, there were only two very minor incidents: a turbine blade came slightly off its truck trailer, and a truck carrying a transformer skidded a bit off the road. While every wind farm project is a logistics challenge, the LADWP was fortunate with Pine Tree in that the 80 GE wind turbines had already been delivered to a nearby location, the Mojave Airport, about 20 miles from the site. "We had it fairly easy on that-the real hard part was in getting the turbines transported up to each of the sites." And of course, there is also the wind to deal with while constructing and erecting the wind towers. "With a wind power project, a good wind resource is what you are looking for on one hand, but strong winds can be an impediment when you are building, and they certainly were for us," says Gentner. They had 47 days of no work, due to high winds, rain, or snow, during a 14-month construction schedule. While wind characteristics can vary from one wind farm to another, an issue LADPW had to deal with was the lack of uniformity of the wind from one turbine location to another. "We have a lot of gusting, which has to be dealt with from an operational point of view," he noted. "We have a different wind profile from one turbine to the next, and they are only a couple of hundred yards apart." The wind may vary, but overall it is a rich wind resource. 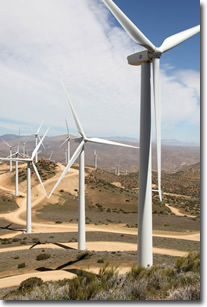 The Tehachapi is second only to the Palm Springs area for having the best wind resource in California. "That in itself tells you one of the reasons why we are there with the wind farm," says Gentner. In addition to its tremendous wind resource, the Pine Tree location also has some other characteristics. Department of Fish and Game authorities. There is a species of tortoise in one section of the project, and that had to be looked at carefully and monitored. Construction crews carefully followed all the regulatory requirements. To keep on top of such a huge construction project, and keep it moving forward, there were weekly construction meetings, complemented by sub-meetings, dealing with areas such as electrical and the commissioning of the turbines. "That was something I carried over from other large projects," says Gentner. "If you catch a problem at the beginning, or near the beginning, it's a lot easier to solve, and we were able to do that on a very consistent basis." While every wind farm project is a logistics challenge, the LADWP were fortunate with Pine Tree in that the 80 GE wind turbines had already been delivered to a nearby location, the Mojave Airport, about 20 miles away from the site. Gentner, who retired shortly after the completion of the Pine Tree wind project, said it was an interesting project to wrap up his 39-year career. In the past, he has worked on a number of more traditional projects, such as coal-fired power plants. Gentner noted that wind projects, while still essentially made up of a group of smaller power plants, differ in a number of ways, especially at the utility level. "Wind farms are a big change for the grid operations," he says. "Grid operations look to have control over generation, rather than the other way around, so this is a new experience for them. Just the idea of wind gusting and megawatts changing every few seconds is an experience grid operations need to get used to." The other big difference is the nature of operations and maintenance of wind farms versus traditional power plants. LADWP staff members have received extensive training, however, and have been maintaining the facility from its start-up. And it's been working well so far. In the first few weeks of operation, the availability of the wind farm was 90.1 percent, with a capacity factor of 47 percent. This kind of success bodes well for further projects, but in going forward with wind power-and renewable energy in general-LADWP general manager David Nahai says utilities will have to look at some major changes. "Transmission of renewable energy is a very difficult issue, because it is now very difficult to launch and complete a transmission project. But if we are going to successfully move toward renewable energy, we have no choice but to build transmission." In the case of the Pine Tree project, LADWP was fortunate that only eight miles of new transmission were required, connecting to the Barren Ridge Switching Station. This connects Pine Tree wind power to a high voltage transmission line running down the east side of the Sierra Nevada Mountains into Los Angeles. There are other issues going forward, Nahai says. "As we move away from coal to renewable, there has to be a balancing within the renewable portfolio and even within the particular classes of energy." Wind from the Tehachapi area does not have the same characteristics as, say, wind in Washington or Oregon, he points out. "There is going to have to be a balancing within the renewable categories, such as wind and solar. Integration of renewable energy, and balancing to ensure power reliability, is a challenge." Wind power and solar power, of course, are intermittent and will have to be augmented by traditional energy sources, such as natural gas-powered plants. In summary, it's going to take a combined effort-with renewable energy meshing with other energy sources-to deliver reliable power to consumers and businesses. Bigger picture-utilities have to be very concerned about some of the cap and trade carbon emission proposals being currently discussed, says Nahai. "As utilities such as LADWP make the investments in renewable energy and programs to cut greenhouse gas emissions, we want to make sure those investments go towards direct reductions, rather than having those funds-which can be very sizeable-getting diverted for the purchase of allowances or into a cap and trade market which will not result in the immediate reduction of greenhouse gas emissions, as a direct program will." That said, Nahai remains positive about dealing with these hurdles. "There is no shortage of problems to overcome, but we believe the problems are by no means insurmountable. And we believe moving away from coal is something we must do. So we're dealing with all the issues, and we'll move forward positively."